Your school is registered to attend an SEC event. What's next? The Local Organiser will be in contact with you in the lead up to the event. They will provide you with a number of important documents, including the Teachers Guide which will tell you everything you need to know about the event. Please consult this document in the first instance. Below are other important documents that you will be provided and a list of Frequently Asked Questions (FAQs) by schools and teachers. If you have any further questions please contact your Local Organiser. Not registered for an event? 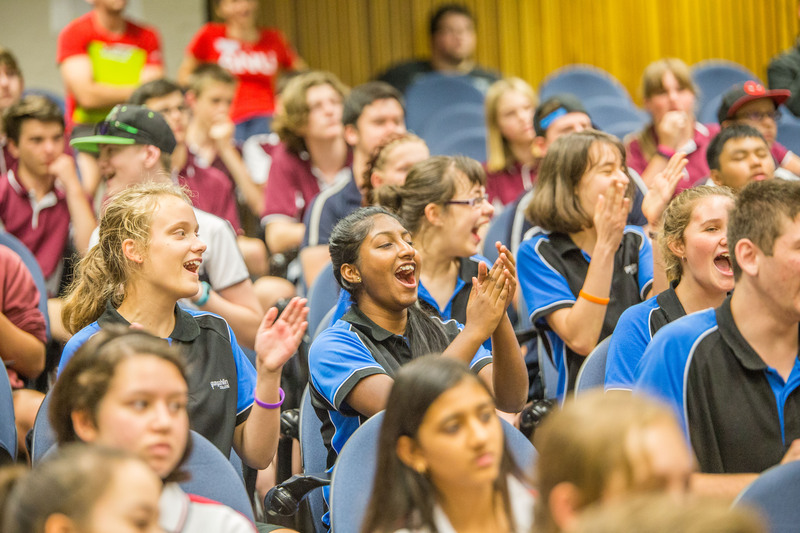 Check out our Events Calendar to find an event near you and if you are interested in attending please contact us at challenge@newcastle.edu.au or +61 2 4921 7319. There is usually a participant change of $440 per school to attend an event. Please confirm this with your Local Organiser as some committees subsidise this charge. Schools are also responsible for student transport to and from the event. What age students can we bring? Students younger (but not older) than this may also attend to fill up school numbers. For Challenge or Discovery Days you can bring anywhere between 16-32 students. You must ensure these students are split across the 8 activities (a minimum of 2 and a maximum of 4 students per activity). It may be possible to attend with less than 16 students if you are willing to combine with another school (contact your Local Organiser to see if this is possible). Unfortunately, any students over the 32 threshold will not be allowed to participate. There are usually 8 activities at a Challenge or Discovery Day event (each student group will participate in one or two of these). There is usually a mix of half and full day activities that promote teamwork, problem solving, innovation and creativity. They could be a design-and-build or critical thinking-style activity. The Teachers Guide provides information about the activities at your event and you will be sent more detailed notes for students. Find out more about our suite of activities (current and retired). We are struggling to get student numbers. How can we increase interest amongst my students? Although most schools have a waiting list for student attendance, we understand that this is not always the case. If you are struggling to get numbers, check out our YouTube site for promotional videos that can be used to generate interest in our events. We also encourage students to check out our Facebook and Instagram pages. If your school has attended an event in previous years we suggest inviting some of these students to talk to current students about what to expect and what is involved. Although some students may be hesitant to attend an event at first, they always have a fantastic time, and this is evident in our student and teacher feedback. Recognising student attendance with a certificate following the event can also assist in getting the word out there each year. When is the Participant Registration Form (PRF) due? The Participant Registration Form (PRF) requires the names and details of students attending the event, any medical requirements, teacher contact information and media consent clearance. Please return this to your Local Organiser approximately 1-2 weeks before the event so we can ensure that all schools are appropriately organised and we can cater for any special requirements. How do we group students? Students are grouped according to colours on the Participant Registration Form (PRF) which you need to fill in before the day (please bring an updated copy on the day if there are any last minute changes). These colours will correlate to the activity/s the students will be participating in. See the Teachers Guide for more information. When you arrive at the event you will be met by either the Local Organiser or the Event Assistant who will check your school in and give you a collection of coloured wristbands. Teachers are then required to hand these out to students according to the colour groups they are in. These coloured wristbands will quickly and easily identify where students are meant to be throughout the day. Once the day has started students can't swap wristbands or change activities. How students are grouped is entirely up to the school and teachers, but keep in mind the ability to work well in a team is the most important ingredient for success. Please ensure there are 2-4 students per colour group. Why do we need to arrange media consent? Quite often radio, TV and/or newspapers cover our events. You must inform us of any student who does not have media consent so that we can take the necessary steps to ensure they are not photographed or videoed. What can we do to prepare students for the activities? How you prepare students before an event day is up to individual schools and teachers. Check out our Teachers Resources section for information that can be used to supplement each activity (background information, real life examples, related careers and degrees, a vocabulary list, resources/links and example learning activities). We will be launching lesson plans soon! Where can I find a Risk Assessment for the event? A risk assessment for each activity can be found in the Teachers Guide provided to you by the Local Organiser. We recommend that students wear school or sports uniform, with enclosed shoes (for safety and comfort). What materials should students bring to the event? Students should bring a pen only to the event; everything else is provided for them. Students are not allowed to use any other materials that they bring with them (including notes and plans). What do we do if we are running late or cannot attend on the day? If you are running late to an event or something unforeseen has occurred and your school is no longer able to attend, you need to contact the Team Leader and/or Local Organiser of your event ASAP. The details for these people can be found in the Teachers Guide. If sufficient notice is not given then your school may still be invoiced the participant charge. What happens if there is a medical or behavioural problem with a student? Schools/teachers retain a duty of care to their students throughout the event. We suggest each school brings a First Aid Kit and monitors/supervises their students. You will be contacted immediately by the Team Leader or Local Organiser if any issues occur on the day. Where can I find photos from our event? We often place photos and/or videos from events on our Facebook and Instagram pages. We also encourage others to take photos and share them using the hashtag "sciengchallenge". My school won a regional event day. Will we be invited to a State or National Final? Who are the ‘key players’ at the SEC? The SEC team is led by a Director who is guided by our governing body, the National Science and Engineering Challenge Council (NSECC). Membership on this council varies each year but generally includes representatives from the University of Newcastle and Regional Chairs/Local Organisers from around Australia. We loved the event! How can we stay up to date with the SEC? Follow us on Facebook or subscribe to our quarterly newsletter "Your Challenge" here.